One of the things I have been most impressed with on this forum is the quality of the pictures you are all taking. Mine are awful in comparison. This was taken just now, and is the best so far. 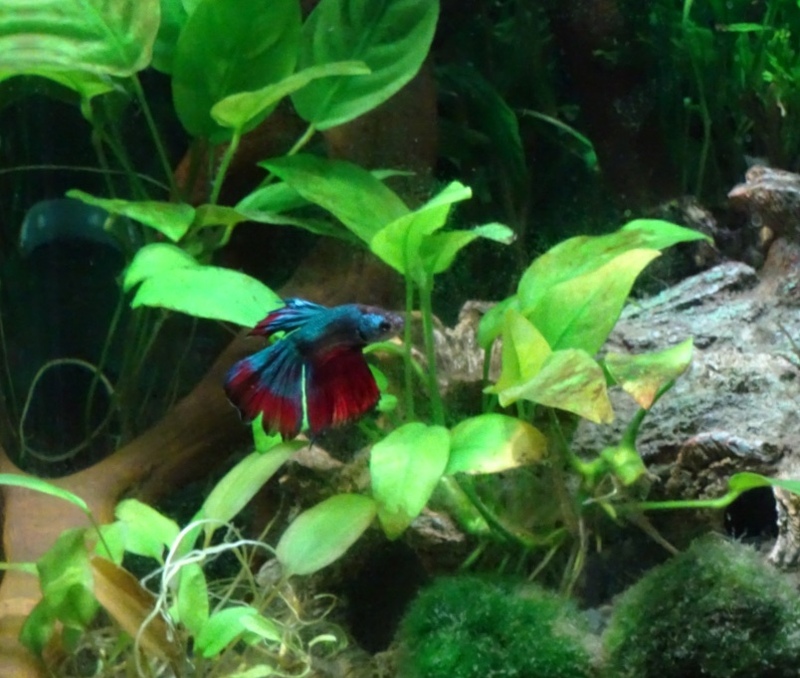 One good thing is that I have just spotted a thread in this subfora on how to take better betta pics. So I am off read every post. Tagawa has only been With me for 3 weeks, and only recently has been extending his dorsal fin properly. He kept it clamped the first few days, so I think it was injured, either during or before arrival. No sign of any fungus or finrot, and he seems to be using it comfortably now. I can now see that the front edge is stripped down to the bony ‘spine’ and there is a tiny hole too. It is obviously getting better. :) since he is stretching it and using it. But do you have any idea how long it will take to heal? I do not see a thing wrong with your photos. They look really good to me. Thank you. I’m wrestling with the focus. Some of the pics around here are beautifully crisp. I agree with @RussellTheShihTzu , lovely Photograph's. I can't see an issue with the Focus, I mean I can see Individual strands on the Moss Ball and the Fin detail. For me that's a great photo, but look forwards to your efforts to improve anyway. 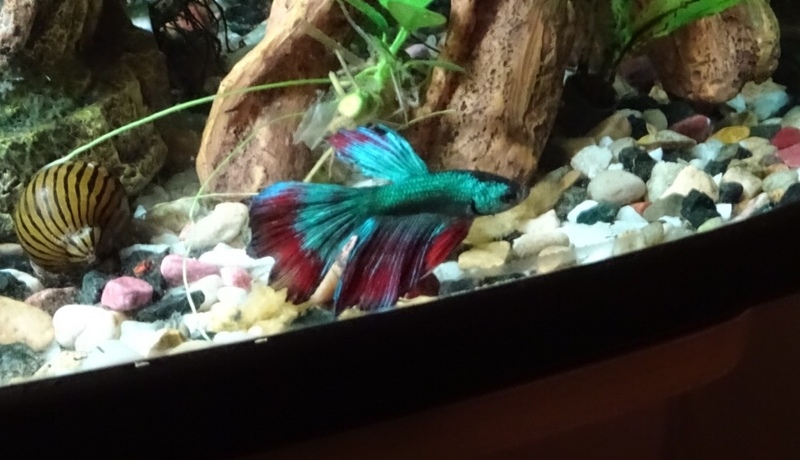 In regards to the fins, maybe a couple of weeks, I would be tempted to do small water changes to make sure that the conditions are as great as possible to assist him healing. Introducing Cracker. Who is crackers. Turned out we had a shrimp exploring in Tagawa's floating log! Fortunately, Tagawa hadn't noticed, and just continued goofing around. But no, back to cruising the territory. Oh, and I am delighted to report that Tagawa is not using his dorsal fin comfortably, and it looks like it is growing back. That is ‘now’ using his dorsal, not ‘not’ using it! You should do a photo journal! Oh, you have 20 minutes to edit or, you can PM me and I will do it for you if it is over 20 minutes. Delighted to say that Tagawa has put on a bit of weight this week. I stepped up to 4 tiny meals a day, instead of 2 small meals. He is eating the same at each meal, so is now eating twice as much. No bulge on the tum, and he is definitely looking more prosperous. 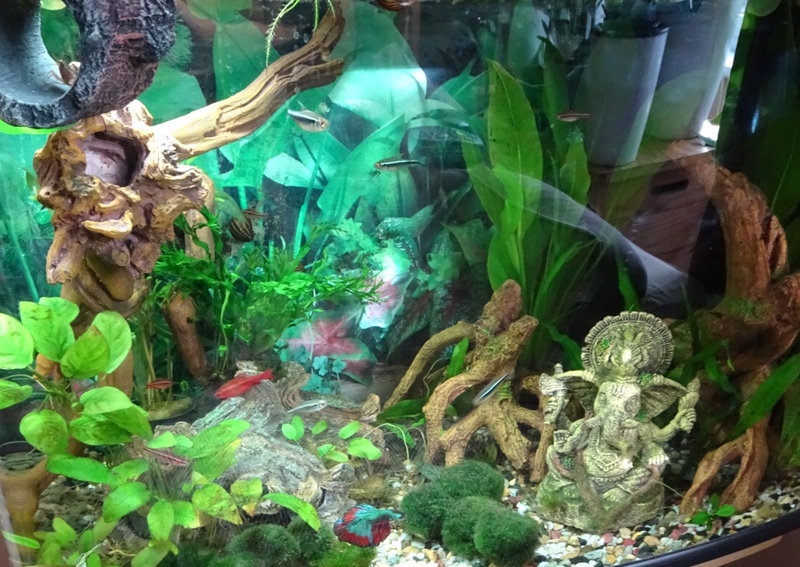 the other fish in the tank (cherry barbs and neons) are loving it, but it is a v fine line and I can't keep this up for long, or they will all be spherical, because I don't want them to put on weight too. RussellTheShihTzu and Ratvan like this.